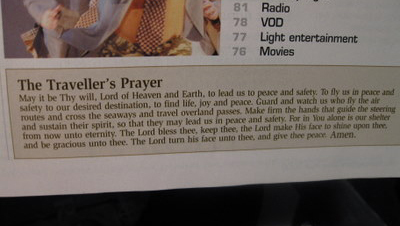 I was scanning the in-flight magazine trying to find the music station listings when I stumbled upon the above prayer. There it was on the first page just below the table of contents. I thought it was a fitting way to begin my one week visit to the Holy Land. A simple prayer. A simple reminder that I would be walking this journey – as I do every journey – with God at my side. This particular journey, however, is going to be a once in a lifetime experience. Over the next week I will visit places I have read about in Scripture for years – from Nazareth, to the Sea of Galilee, to Bethlehem, to Jerusalem…. I will walk where Christ walked, where he taught, where he healed, where he suffered and died, where he was laid to rest, only to rise three days later. I will follow in the footsteps of the Apostles and Our Blessed Mother, of thousands of Christians before me, not to mention figures of the Old Testament – the Prophets, our Patriarchs. I’ve been told that I will never look at Scripture in the same way. I’ve been told that at points I will look up and expect to see Jesus. One colleague dropping me off at Toronto’s airport told me this pilgrimage will make me a better husband, a better father, a better person. Whatever the fruits of this pilgrimage, it will be clarified over time. But for now I’m going to absorb as much as I can, and share it with you here on the S+L blog. Bless me Lord, shine your face upon me, and be gracious to me during this week. Amen. Read the rest of the entry to see the entire prayer. May it be Thy will, Lord of Heaven and Earth, to lead us to peace and safety. To fly us in peace and safety to our desired destination, to find life, joy, and peace. Guard and watch us who fly the air routes and cross seaways and travel overland passes. Make firm the hands that guide the steering and sustain their spirit, so that they may lead us in peace and safety. For in you alone is our shelter from now unto eternity. The Lord bless thee, keep thee, the Lord make His face shine upon thee, and be gracious unto thee. The Lord turn his face unto thee, and give thee peace. Amen.